The name Kuchipudi denotes both the dance style that has come to prominence since the 50s and the tiny, remote village where it was born. Kuchipudi, little known outside a few villages skirting it, has no come to occupy a very significant place on the dance map of India, though it has yet to acquire the prestige and acceptability it fully deserves. Situated in the Krishna district of Andhra Pradesh, it is 32 miles from Vijayawada. 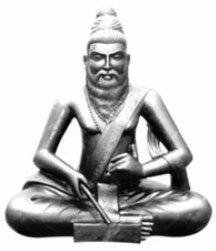 Siddhendra Yogi, who lived in the14th century AD was not only and exceptionally gifted scholar and artist, but was also endowed with a great creative vision. He broke new ground by adapting the format of the existing Yakshagana folk dance dramas. He began to propagate the Bhama cult, also known as Madhura Bhakti, like Satyabhama, every devotee imaginesLord Krishna to be the Supreme Lover, the Lokabharata, and himself to be cast in the image of Satyabhama, longing to unite with Sri Krishna and keep him entirely to herself. Song after song poured out of the heart, at the separation from her divine lover, into these inspired works. The songs compiled together became the vehicle of a dance drama of unsurpassed beauty and came to be called BHAMAKALAPAM. The Bhamakalapam songs were so enchanting and so full of rich imager that the temple dancers and court dancers residing at Srikakulam and Ghantasala were eager to learn them and dance to their tunes and lines. But Siddhendra Yogi feared that, since the theme centered to the romantic love between Sri krishna and Satyabhama and since the dancers already excelled in the art of portraying the SRINGARA rasa or romantic love, they may exaggerate the sentiments and destroy its lofty spiritual ethos. Naturally he decided to initiate only young and good-looking Brahmin boys into the art. He taught them the Bhamakalapam Song. He overcame the objections of their families to this unprecedented step by assuring them of salvation- an assurance that was further strengthened by a letter from the head of the math of Udipi offering them his patronage. He made these few families take a vow that at least one male child born into each one of them would devote the entire life time to singing and dancing the glory of the lord. Bell tied around the waist of the newborn boy symbolizes this vow. Under Siddhappa’s leadership they traveled some village to village performing these dances and came to the called KUCHILU, an abbreviation of the Sanskrit word KUSILAVA, meaning the cast of a dramaticostracized them treating them as socially inferior and undesirable. Siddhendra was not disheartened, he took the Brahmin artists to the waste land near by and made it their own special residential settlement which was gradually transformed into a village know as KUCHILAPURAM or the abode of dancers-actors. This was later corrupted or shortened into KUCHIPUDI. To this day the village remains the home of the same nine families who originally settled her turning a waster land into temple of arts. And to this day they observe the same strict discipline that was imposed on them by Siddhendra Yogi. Besides rigorous training in classical dance which also includes a series of thought Physical exercises necessary to make the body supple and flexible they have to study a religious texts, Sanskrit as well as music, both theoretical and practical.